Attorneys challenging the California High-Speed Rail Authority’s bond funding will hold a press conference on Tuesday, September 2, 2014 to explain the petitions they are filing with the California Supreme Court. Michael Brady and Stuart Flashman, representing John Tos, Aaron Fukuda and Kings County, will offer copies of the Petition for Review they plan to file that morning. In addition, Harold Johnson of the Pacific Legal Foundation will discuss the petition he will be filing on behalf of the First Free Will Baptist Church in Bakersfield. The Howard Jarvis Taxpayers Association will also be represented at the press conference, barring scheduling difficulties. The Tos Petition for Review will be available on the morning of September 2, at the bottom of the TRANSDEF web page, along with all documents from these two cases. Three other claims in the Tos case are still pending in the trial court. The Tos v. California High-Speed Rail Authority case was brought by a farmer, a rural homeowner and Kings County. It asked the Court to block the Authority from using bond funds because the project failed to meet the ballot measureʼs requirements. In November 2013, Judge Michael Kenny ruled that the High-Speed Rail Authorityʼs Funding Plan failed to properly certify, as the bond measure required, that all needed environmental clearances had been obtained and that sufficient funding was available to complete the Merced-to-San-Fernando-Valley segment of the project. In California High-Speed Rail Authority et al. v. All Persons Interested et al., Judge Kennyʼs ruling blocked the issuance of bonds because of another failure to satisfy bond measure requirements. For more information, please visit us at http://www.cchsra.org and/or contact Shelli Andranigian at andranigianmedia7@att.net. Thank you. My compliments to all of the CCHSRA members for a well organized and professional opposition to this terrible project. The legal team is to be commended for their continued involvement and this move to petition the California Supreme Court. Let’s hope that the judges read the law and not Brown’s directive. Of interest to people that favor the project should be the numerous reports that have questioned the viability of this boondoggle. A listing of these reports: LAO, the State Auditor, the OMB, the Peer Group, the Reason Foundation, Cal Watchdog, plus many editorials. On the other hand, it is obvious that the opinion and recommendations of unbiased, knowledgeable people has no impact if politics and money are involved. Californians in 2008 approved Proposition 1-A, “The Safe, Reliable High Speed Passenger Train Bond Act for the 21st Century”. The California High Speed Rail Authority (CHRSA) plans for “Blended Rail” – HSR on Caltrain tracks between San Jose and San Francisco – would be neither safe nor reliable. HSR needs right of way that is secure: fenced and grade separated. Instead of demanding that, CHSRA and its local partners promote a “one-seat HSR ride” to an ill-named “Trans-bay Transit Center” in downtown San Francisco oriented only to trans-Bay bus, not rail, transit. We fence and control access on freeways, where a common speed limit is 65 mph. Caltrain runs up to 79 mph past commute stations and grade crossings. Wikipedia Bourbonnais train accident to see what can happen on 79 mph track at a grade crossing. Increasingly passenger trains run in push mode, without a locomotive shield in front. HSR would boost that speed to 125 mph on Caltrain tracks. Enhanced grade crossing safety is logical as a “bookend” connector use of HSR bond funds, but HSR cannot safely run on those tracks. 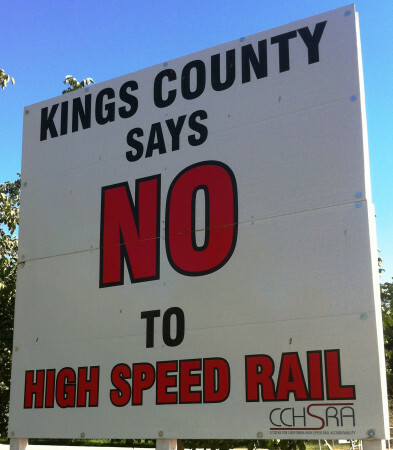 Don’t let CHSRA squander HSR bond funds electrifying Caltrain or extending it to the TTC on track unsuitable for HSR. Initial HSR to the Bay Area should end at San Jose, with near seamless transfers there to Caltrain, Capitol Corridor, VTA light rail, and BART. Newark, Mulford, and Oakland to Sacramento with added track, fencing, and grade separations. From a new transfer station at the BART overcrossing in Oakland, downtown San Francisco’s Embarcadero station is six minutes away, with trains every 4 minutes or oftener. This would be far better for the region, much safer and more reliable, and less costly than what CHSRA has offered. I saw nothing in out BANG newspapers. Sorry I couldn’t make it. What transpired? Our BANG newspapers. Sorry for the goof.